This week at Kelly's Blog for Show Us Your Life the theme is Wedding Party and flowers. I had always pictured my bridesmaids wearing floor length dresses, but after we decided on a July date I felt like tea length dresses would be more appropriate. I had originally wanted my wedding colors to be brown and green with some pink, but after I found these dresses with the perfect color of pink it ended up becoming brown and pink with some green. For the pink in my wedding I didn't want just one pink, I wanted to incorporate all pinks, bright, light pastel, etc. I love the light pink of the sash on the bridesmaid dresses. I love this shot of the bridesmaids, peeking into the sanctuary to watch a video that Luke and I played before the ceremony got started. My favorite picture of the whole wedding party: My bouquet: So beautiful! I love this picture, it shows how bright and vibrant my bouquet was and how Luke's boutonniere matches and the rose petals in the aisle. I just love it. Thanks for looking! I like how you incorporated various shades of pink in the bouquets! They are so pretty!! Love the colors!! Peonies are my absolute favorite flower...so pretty in your bouquet!! Your bouquet is gorgeous! Love the colors! I really like the bridesmaids' necklaces. I absolutely adore your wedding pics! They are so gorgeous. I love the one with the entire wedding party where you are leaning on Luke... so cute!! beautiful! love love love your bouquet! I used brown and pink too. Great color combo! Beautiful wedding! Love these! Everything just looked beautiful! BEAUTIFUL!!!! I love that pic of the bridesmaids too! I really like those bridesmaid dresses!! So pretty! I just love your colors and everything! You looked so beautiful and it is so fun to look at these!! I love the fabric on your BM dresses! I am wearing the same bridesmaids dress for a wedding in October! Same colors and all! I'm pretty sure yours was the prettiest wedding I've ever seen! I love everything - the colors, your dress, the bridesmaid dresses/necklaces, the pictures. Perfect! You did good my friend. Thanks for sharing your pics. I just love your wedding pictures! Everything was so gorgeous! 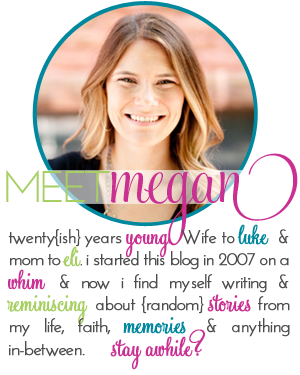 Megan, I seriously love everything about your wedding. Your bouquet was spectacular, as were all the flowers. Gorgeous!! !